A beautiful design to behold in your bar area, the Bella Bar Stool Grey Velvet has a modern elegant appeal that is perfect for a myriad of spaces. With a retro look that is completely timeless, the Bella is a sumptuous and chic choice for your home. 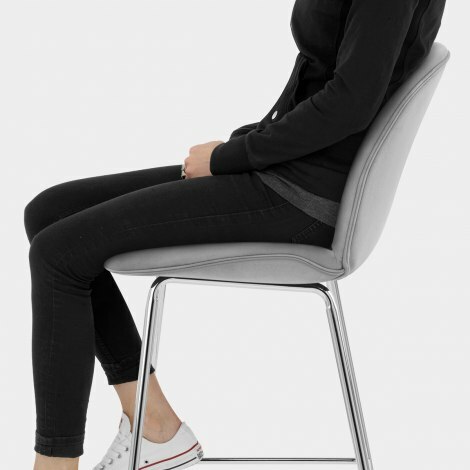 Shaped for optimum comfort, the cushioned seat has an encompassing design with a high backrest that curves around the user for superb support. Swathed in soft grey velvet, the seat is edged in pipe detail and has a subtle refined look. Crafted at kitchen worktop height, the four legs form a sturdy frame and boast a sleek polished chrome finish that is set to shine. The legs are braced with bars to strengthen and form a footrest, and they are complete with protective adjustable feet for use on uneven floors.